As more and more countries start to control the drilling waste and improve the standard of waste discharge in oil and gas drilling field, drilling waste management becomes more and more popular and important. Many companies have to or want to start their business for drilling waste management. But many clients do not have experience on it. They do not know how to choose the suitable equipment or systems for their activities. 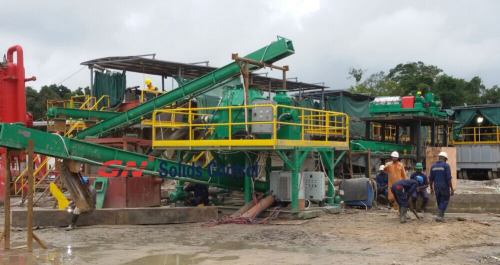 As a worldwide famous brand on mud solids control and drilling waste management, GN Solids Control start its research and development department for drilling waste management and industry waste management for many years. Below is a brief introduction of normal drilling waste management equipment to help the users make decision. 1) High G drying shaker. It is also named High G dryer, cuttings dryer. It utilizes high G force up to 8.0G to dry the cuttings. If there are big particles in the solids waste, high G shaker is requested. It can remove big size solids and even metal particles. The high G shaker can remove solids above 100 microns. It is mainly used to treat the water base mud and water based mud cuttings. It can also be used for oil based mud treatment in some cases. When the high G drying shale shaker is used to treat oil based mud and cuttings, it can only reduce the oil on cuttings (OOC) to 10 ~ 15%. It is also called vertical centrifuge or vortex dryer. It utilizes centrifugal force up to 420G to separate the fine solids and recovery the usable drilling fluids. The screen opening of VG dryer is 0.5mm, 0.35mm and 0.25mm. It cannot allow big size sizes solids or metal particles; otherwise, it will be broken. Vertical cuttings dryer is mainly used for oil base mud and cuttings. It can reduce the oil on cuttings to 3 ~ 5%. In this case, the solids discharge is on a very dry condition and it is easy for shipment. And the solids with 3~5% OOC can be discharged directly in many countries. If not, it is also easy for next treatment. It utilizes the high centrifugal force to separate the very fine solids to 2～5 microns. It is used after high G shaker and vertical cuttings dryer, for further separation. There are many other equipment used for drilling waste management, we will introduce in next file.